A crime novel set in Atlanta in 1948, Darktown uses the genre to shine a light on a point in time in American history and, in doing so, on present day America. Thomas Mullen uses as his jumping off point the true story of the appointment of the first eight black policemen in Atlanta. They do not have an office, instead they are forced to operate out of the basement of a local YMCA. They were not given cars and had to call in white detectives when a matter needed investigation. Distrusted almost as much by the locals in their own, segregated neighbourhoods as by their fellow police officers, they were nevertheless part of the vanguard of a nascent civil rights movement. Lucius Boggs, son of the local preacher and recently returned from the Second World War, is one of the first eight black policemen in Atlanta. He and his fellow recruits are keen to clean up their part of town, rife with bootleggers, gambling and prostitution. To add to their problems, many of those enterprises are either sponsored or actively managed by their white police colleagues who make money from turning a blind eye and who are not keen to see any change to the status quo. Despite not being permitted to investigate crimes, Boggs and his partner, Tommy Smith, surreptitiously take on the investigation of the death of a young black girl who has died in suspicious circumstances but whose case has been shelved. On the other side of the tracks, Rakestraw, a white rookie cop who also saw action in the War is supposed to be learning the ropes from an ageing corrupt, violent, racist partner. While Rakestraw does not necessarily want to see the communities of Atlanta integrated, he does want to do something about the corruption that surrounds him and see the fledgling black police force succeed. And it is this interest that also sees him investigating the same death as Boggs and Smith. 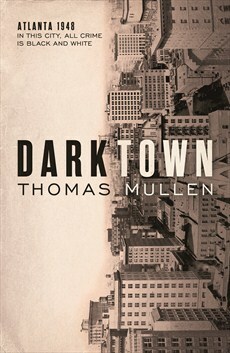 Darktown has a James Ellroy feel to it. A tightly plotted procedural in which police with different agendas and different access to witnesses and evidence are trying to attack a problem separately, finding only late in the piece that they are on the same trail. And while this setup takes a while, the second half of the novel picks up significant pace with some white-knuckle cliffhangers based as much in the social divide as in the criminal activity. And as if to underscore the structure, after mainly separate chapters, a single chapter climax alternates between the two main characters as they work at different angles of the case. The historical context not only highlights how attitudes have changed since the 1940s but how the attitudes of those times are still not far from the surface. Mullen explores the way the new policemen are treated, not only by their colleagues but by the wider community and in some cases their own community. He also looks at the still all too common tensions and reactions to the way neighbourhoods change over time. There is an optimism here. Mullen makes clear the strength of will and purpose that carried these men through, a strength which formed the backbone of the civil rights movement. A strength that continues to be needed in a world that is still haunted by the attitudes of the 1940s.